Easy Start to Weight Loss, Plus Protein-Packed Breakfasts! With two kids and a hectic lifestyle, I'm finally ready to commit to losing this excess weight. Any tips on starting small so I don't get overwhelmed? Great question! Many people wanna shed extra pounds but don't know how to get the ball rolling. Just thinking about losing weight can be overwhelming enough, so I'm not gonna weigh you down (no pun intended) with the usual DOs and DON'Ts -- these are all DOs to help you stay positive! Do set short-term goals. "I need to lose X pounds in Y months!" is a surefire way to discourage yourself from the get-go. Keep it short term and simple. For example, aim to lose a few pounds in a couple of weeks, or tell yourself that you'll make smarter lunch choices this week. Make little changes in the right direction, like swapping out greasy chips for baked ones, substituting dessert-flavored light yogurt in place of pastries, or dropping sweetened soda in favor of water. Check out our newly updated 2013 Supermarket List for some grocery-store guidance! Do listen to your body. If your stomach's growling moments after you finish eating lunch, or if you're feeling faint in the middle of a workout, your body is trying to tell you something. You might need a different combination of fat, carbs, protein, etc. Everyone's nutritional and metabolic needs are different, so instead of following rigid diet plans, figure out what works best for you and your body. Do keep it stress-free. If you don't have time to count your calorie burn, let a fitness-tracking device -- like Bodybugg or Fitbit -- do it for you. The 'bugg and the 'bit also have functions that help manage your calorie intake. Even a simple pedometer can help you track your activity (and inspire you to increase it). Do keep going. Okay, I wasn't TOTALLY honest... there is one DON'T. DON'T be too hard on yourself! If you make a questionable food choice or overdo it on your portions, just get right back on track. Acknowledge that you're taking steps toward a better-for-you lifestyle... and that's a great thing! For a TON of helpful resources to get you started, click here for our New Year, New You! (Tips & Tricks for 2013) email. Good luck! I'm looking for some high-protein breakfasts. Protein makes me feel fuller than carby stuff. Any ideas? Thanks! It's All Greek to Me: Fat-free Greek yogurt is crammed full of protein -- about twice as much as regular yogurt! I love the plain fat-free yogurt by Fage and Chobani. (Add a packet of no-calorie sweetener if you've got a sweet tooth.) Crunch it up by mixing in some cereal or crushed mini rice cakes. For a tasty addition, top your yogurt off with freeze-dried fruit or chopped fresh fruit. If you want something with built-in flavor additions, grab a container of Chobani Greek Yogurt Flips, which comes in fun flavors like Key Lime Crumble, Strawberry Sunrise, and Honey Bee Nana. With 10 - 12g protein in each portion-savvy cup, they're flippin' good! For an alternative to Greek yogurt, try cottage cheese. This Double-0-Cinnamon Apple Breakfast Bowl is stuffed with 13.5g protein, and it tastes delicious! Egg-cellent Recipes: Kick off your day with protein-packed egg dishes! Eggs are very satisfying, thanks to all that protein. HG recipes typically call for fat-free egg substitute like Egg Beaters Original, which has 5g protein per 3-tbsp. serving. Got a big day ahead? Whip up our Big Green Omelette (25g protein!). Pressed for time? Check out this BLT B-fast Burrito, and click here and here for half a dozen egg mugs! Meaty B-fasts: How could we talk about protein-rich breakfasts without mentioning meat and meatless swaps? Sprinkle ground-beef-style soy crumbles (Boca and MorningStar Farms are HG favorites!) over any savory breakfast to pump up your protein power, or add center-cut or turkey bacon as a tasty side dish. These B-fast Waffle Tacos are a double whammy, combining waffles with a "meaty" egg scramble -- it's like two breakfast plates in one! For brunch, the Chili Dog Egg Mug is a dish that packs chili, hot dogs, egg sub, and a whopping 27g of protein into a mug. Ham lovers will flip for the Hungry Grilled Ham 'n Cheese Waffle 'Wich, and there's no doubt that the Good Morning Mega Quiche will satisfy any bacon fiend. Freezer-Aisle Finds: There are many heat-n-eat b-fast sandwiches, wraps, bowls, and burritos that are high in protein without being high in calories and fat. 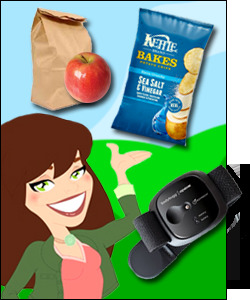 Check out VitaSandwiches, the Weight Watchers Smart Ones Smart Beginnings line, Jimmy Dean Delights Breakfast Sandwiches & Breakfast Bowl, Special K Flatbread Breakfast Sandwiches, and Cedarlane Egg White Omelettes & Breakfast Burritos. Good stuff! And if you just want some portable proteins, pick up a LUNA Protein bar, Quest Bar, or Nature Valley Protein Chewy Bar -- then hit the road! Now you can consider yourself a PRO at high-protein breakfast foods! Fun fact! February is National Return Shopping Carts to the Supermarket Month. Shouldn't this be every month? Give back those carts, people!